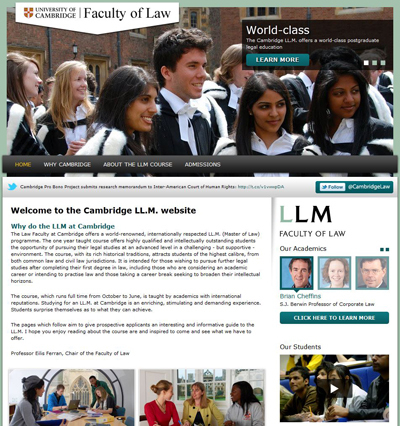 The Law Faculty at Cambridge offers a world-renowned, internationally respected LLM (Master of Law) programme. The one year taught course offers highly qualified and intellectually outstanding students the opportunity of pursuing their legal studies at an advanced level in a challenging - but supportive - environment. The LLM course, with its rich historical traditions, attracts students of the highest calibre, from both common law and civil law jurisdictions. It is intended for those wishing to pursue further legal studies after completing their first degree in law, including those who are considering an academic career or intending to practise law and those taking a career break seeking to broaden their intellectual horizons. Full details concerning the LLM for those considering applying are available on the LLM website. The University Graduate Studies Prospectus is available from the University website.